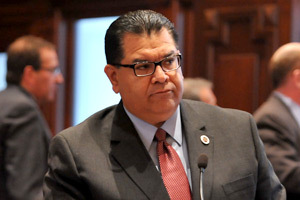 State Senator Martin Sandoval (D-Chicago) received the highest award Mexico’s Lower Legislative Chamber (Chamber of Deputies) grants for his commitment and hard work to better the Mexican diaspora in the United States. The award “Solidarity Immigrant” has been presented to numerous high profile personalities in the past including Antonio Villaraigosa, former Mayor of the City of Los Angeles. Senator Sandoval received the award on December 15, at Mexico’s National Capitol (Legislative Palace of San Lazaro), from the President of the legislative body, Deputy Jesús Zambrano Grijalva, and the Chairman of the Immigration Affairs Committee, Deputy Gonzalo Guízar Valladares. During his stay in Mexico City, Senator Sandoval met with the leaders of the National Senate, Mexico City’s Mayor, Miguel Ángel Mancera, and with the President of Mexico, Enrique Peña Nieto.